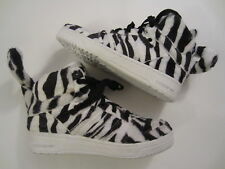 Adidas x Jeremy Scott White Tiger (B26037). Adidas Originals Jeremy Scott JS GORILLA MONKEY. 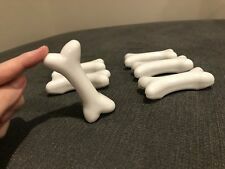 they are 100% REAL! 100% Authentic and a RARE 2012 model! 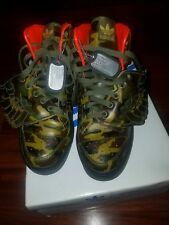 Hey there, these Adidas Orginials Jeremy Scott Wings are size 6.5 Mens. They are tried on but have never been worn out. The shoes have zero creases and come with Orginial dog tags. I never had a reason to pull out this box so I'm selling them to make room for the future. Buyer pays for Shipping and NO Refunds. If you contact me I'll reply ASAP. Have a great day. Adidas Nizza tooling Rubber outsole. The classic low-fi basketball shoe gets a hi-viz update in these eye-catching Jeremy Scott tiger-print canvas shoes. In the last picture you can see the size chart from the adidas official site for the unisex shoes. I can teach you 2 basic things how to spot reals and fakes! 100% AUTHENTIC and Rare Model (2012 Edition). Maker ADIDAS. 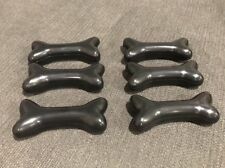 ONE OF THE SOLE INSERTS IS MISSING. Size THEY ARE STAMPED USA 5. Color(s) GREEN PINK YELLOW RED. These shoes are in used condition. They have the average wear and tear of a used pair of shoess. I will try my best to be your help. We will try our best to resolve the issue! I can teach you 2 basic things how to spot reals and fakes! NEW with the original Adidas box. 100% AUTHENTIC and Rare Model (2012 EDITION). Hey there, These Adidas Orginials Jeremy Scott Wings 2.0 Black Flags are size 6.5 Mens and in perfect condition with Orginial Box. I tried one foot on but never worn them out. I loved the shoes however I never found a reason to pull them out and wear them so I'm selling them to make some space for the future. I'm not accepting less than the asking price. If you contact me I'll reply ASAP. Buyer pays for Shipping and NO Refunds. Have a blessed day. Adidas Originals Jeremy Scott JS GORILLA MONKEY. I can teach you 2 basic things how to spot reals and fakes! 100% Authentic and a RARE 2012 model! Adidas Jeremy Scott Black Wing 2.0 Cutout Men Size 6.5 Shoes Sneakers ITEM FEATURES! • 100% Authentic • Limited Edition • Fits women size 8-8.5 • Just right size • Excellent condition Please look at the pictures! If anymore pictures are needed or questions drop a direct message! The funds gets reinvested towards my goals! THANK YOU! NEW! Adidas Jeremy Scott Bones, Fits All Size Shoes! NEW! Adidas Jeremy Scott ASAP Rocky Black Bones Tribute, Fits All Size Shoes!